Shenzhen Rakinda Technology Co., ltd has been committed to automatic identification for more than 10 years, and continuously launched products, which can be upgraded, innovated and applied to various industries according to the market, and customers can choose according to different demands. With the change of people's lifestyle, people are more and more inclined to travel, especially going abroad. So passport is very important in many areas around the world. In traditional way, visitor info. Need to record by labor. So there are wrong recording. 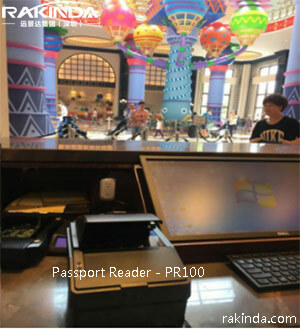 Considering this situations, Rakinda Technology Co., ltd keeps pace with time and develop new product: Passport reader-PR100. Printed data is extracted from the entire data page, from MRZ (1~3 Line), OCR and 1D（Code 128, Code 39, EAN, UPC）, 2D（QR，PDF417, Data Matric Aztec ）barcode, while digital data from contactless ICs. Multiple illumination sources: visible, IR and UV are available. And It is widely used for applications such as Customs, Border crossings,Electronic ID,e-Passport,e-Banking,e-Commerce,Duty-Free Shop,Travel agency, Hotel,Consulate… And so on.